EeRom-8U ROM Emulator is aimed at developers who focus on making ROM based programs and data including embedded systems, BIOS, video games, robotics, printer drivers, graphic controller, postscript interpreters, character font libraries, and other ROM based application. In general, the emulator is used during program and data developing period to eliminate the frustration of repeated EPROM burn-erase cycles. EeRom-8U ROM Emulator easily plugs in place of the ROM through the emulator .. target adapter.Other ROM Emulators can emulate only EPROM. But EeRom-8U ROM Emulator can emulate many types of memories (EPROM, Flash-ROM, EEPROM, NVRAM) currently used. So EeRom-8U ROM Emulator can be called a ...memory emulator.... Also EeRom-8U can properly operate with user... board using 8bit/16bit/32bit data bus. EeRom-8U ROM Emulator adopts USB interface. This helps the user to have faster communication speed than the parallel port. From this, the user can enormously reduce the developing time and adopt high speed SRAM(12ns) for matching well with high speed RISC and CISC CPU. Therefore both professional and novice program developers will find that EeRom-8U ROM Emulator can be an exceptional valuable tool. Your target board requires the following memory type for proper emulation with EeRom-8U. 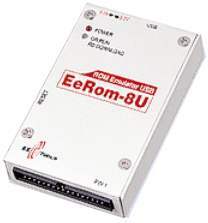 The basic EeRom-8U unit supports 8Mbits with 45NS memory. 29080 1M Special port is required.